Stillman's Battlefield and En route to Dixon's Ferry, IL. Wednesday, May 16, 1832.Stillman's Battlefield and En route to Dixon's Ferry, IL. Dead soldiers are buried. Before return march to Dixon's Ferry begins, Gen. Whiteside draws up army in battle line, "doubtless by way of challenge to Black Hawk." Hasty march is made by hungry army back to ferry. Gen. Atkinson has not arrived. Volunteers are eager to go home, and only by earnest appeal of Gov. Reynolds are officers able to hold men. Gen. Atkinson is encamped six miles below Dixon's Ferry.IHi—BHWC, Johnston Journal; Whiteside to Atkinson, 18 May 1832; William Orr to John York Sawyer, 1 July 1832; John Reynolds, Reynolds' History of Illinois. My Own Times: Embracing also the History of My Life (Chicago: Chicago Historical Society, 1879), 236-37. Thursday, May 16, 1839.Springfield, IL. Lincoln writes and files declaration, bill, complaint, and praecipe in John & Augustus Kerr & Co. v. Prickett in Sangamon Circuit Court. Kerr & Co. are seeking to collect on note for $2,661.77 given them by Prickett at St. Louis May 1, 1838.IHi—Original. Monday, May 16, 1842.Danville, IL. Lincoln represents defendant William Fithian in Cunningham v. Fithian & Juneau and in McDonald v. Fithian & Juneau and asks the court to open the depositions filed in each case. 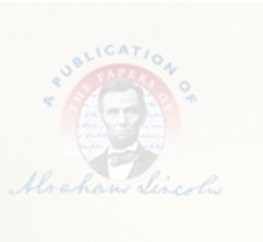 The court grants Lincoln's requests.Decree, 16 May 1842, Cunningham v. Fithian & Juneau, Circuit Court Record B, 321; Decree 16 May 1842, McDonald v. Fithian & Juneau, Circuit Court Record B, 321, both in Vermilion County Circuit Court, Vermilion County Courthouse, Danville, IL. Tuesday, May 16, 1843.Springfield, IL. Lincoln pays for suit. Five yards of material cost $32.50; "trimmings" come to $3.87. He pays Benjamin R. Biddle, tailor, $9. Total cost: $45.37. He also buys $48.87 worth of merchandise.Irwin Ledger and Journal. Saturday, May 16, 1846.Danville, IL? Defendants in Fithian v. Cunningham, Alexander, and Forbes default and plaintiff is ordered to recover debt of $3,200 and costs. Lincoln and Murphy are attorneys for plaintiff, but according to record, only Murphy appears.Record. Middle Lick Creek, Sangamon County, IL. Sunday, May 16, 1847. Middle Lick Creek, Sangamon County, IL. Sometime during this month Lincoln and J. B. Weber address local temperance society. As regular time of meeting was third Sunday of month, it is probably on this date. Attendance is fair. Most of those present have already signed pledge, but three new converts are enrolled. IHi—Minutes of Sangamon County Temperance Union. Tuesday, May 16, 1848.Washington, DC. Lincoln is not listed among absentees when roll is called to determine quorum in Committee of Whole.Journal. Wednesday, May 16, 1849.Springfield, IL. Lincoln writes to Secretary of the Navy William B. Preston and objects to the impending appointment of Justin Butterfield, of Chicago, to the Commissioner of the General Land Office post. Lincoln seeks the office for himself and he notes Butterfield's minimal efforts to help elect President Zachary Taylor. Lincoln writes, "[W]hen you and I were almost sweating blood to have Genl. Taylor nominated, this same man was ridiculing the idea . . . and when Gen: T. was nominated, if [Butterfield] went out of the city of Chicago to aid in his election, it is more than I ever heard, or believe. . . . If there is one man in this state who desires B's appointment to any thing, I declare I have not heard of him." Abraham Lincoln to William B. Preston, 16 May 1849, CW, 2:48-49; Thomas F. Schwartz, "An Egregious Political Blunder: Justin Butterfield, Lincoln, and Illinois Whiggery," Papers of the Abraham Lincoln Association 8 (1986): 9-19. Lincoln writes to Secretary of State John M. Clayton and recommends Ethelbert P. Oliphant, who seeks a diplomatic post. Lincoln writes, "Oliphant, of Union Town, Pa. is a candidate for the appointment of Charge to Denmark." Lincoln informs Clayton that Oliphant, with whom Lincoln served in the Black Hawk War, once lived in Springfield. Lincoln closes, "His success would afford me sincere satisfaction." Ethelbert P. Oliphant to Abraham Lincoln, 8 May 1849, Abraham Lincoln Papers, Library of Congress, Washington, DC; Abraham Lincoln to John M. Clayton, 16 May 1849, CW, 2:48; Ethelbert P. Oliphant to Abraham Lincoln, 28 July 1859, Abraham Lincoln Papers, Library of Congress, Washington, DC. Thursday, May 16, 1850.Paris, IL. Lincoln files defendant's answer and cross-bill in Matkin v. Brown, chancery. Record. He writes demand notice on farm, for John Shearer, to James Lawrence, for Vermilion County case. Photocopy. Friday, May 16, 1851.Paris, IL. Starr et al. v. Cassady, bill to set aside deed, is submitted to court by Lincoln and Benedict for complainants and Dill and Linder for defendant. Court dismisses complainants' bill. Three other Lincoln cases are continued. Record. En route to Paris, IL. Sunday, May 16, 1852.En route to Paris, IL. In the evening, Lincoln arrives by buggy at Paris. The spring term of the Edgar County Circuit Court is scheduled to begin on Monday. David Davis to Sarah W. Davis, 17 May 1852, David Davis Family Papers, folder B-9, IHi, Springfield, IL. Monday, May 16, 1853.Pekin, IL. Tuesday, May 16, 1854.Clinton, IL. Lincoln appears in seven cases in which Illinois Central is defendant. Only one comes to trial. That is Cundiff et al. v. Illinois Central RR et al., trespass case in which jury finds for plaintiffs and assesses their damages at $98.18. He tells court that he and Moore are defense solicitors in Spencer v. Illinois Central RR. Lincoln and Moore act for defense in Cole v. Morrisson, Lincoln writing and filing pleas. In Richey v. Adams, for defense, Lincoln writes and files pleas and notice, and composes instructions for jury. Record; Photocopy. Wednesday, May 16, 1855.Clinton, IL. In Spencer v. Illinois Central RR, trespass, jury finds for plaintiff and assesses his damages at $5.33?. Record. Lincoln writes and files plea in Campbell v. Warner. He and Moore are for Warner. William H. Hanna, who is suing Whitlock, pays Lincoln $20 retainer. Photocopy. Friday, May 16, 1856.Shelbyville, IL. Lincoln writes and files pleas and rejoinder in Terre Haute & Alton RR v. Daniel Earp, signing "Thornton & Rice p.d." Files. Saturday, May 16, 1857.Springfield, IL. Lincoln files praecipe, declaration, and bond for costs in Eshrick, Black & Co. v. Tobias, Hittle & Co. with clerk of U.S. Circuit Court. Suit is brought to enforce payment of note for $831.78, executed by defendants. Record. He also deposits $200 to his account at the Springfield Marine and Fire Insurance Co., and collects $225 from Joshua F. Amos, administrator of Nathaniel Hay. Marine Bank Ledger; Receipt to Joshua F. Amos, 16 May 1857, CW, 2:395. Thursday, May 16, 1861.Washington, DC. President attends wedding of Lt. Lorenzo Thomas Jr., son of Adjutant General Lorenzo Thomas, and Miss M. G. Bradley, at 9 A.M. at Trinity Church, 3d and C Sts. NW. Evening Star (Washington, DC), 16 May 1861, 3:1. Witnesses dress parade of 7th New York Regiment with Secretary of State Seward and reviews troops. N.Y. Tribune, 17 May 1861. General Butler arrives by special train and spends evening in consultation with Lincoln, General Scott, Postmaster General Blair, and Secretary of War Cameron. Group of Alexandria citizens visits President and assures him town would vote one thousand majority against secession. N.Y. Times, 17 May 1861; Blair to Cameron, 17 May 1861, Simon Cameron Papers, Library of Congress, Washington, DC. [Empire City Regiment band serenades Mrs. Lincoln at Metropolitan Hotel in New York. Baltimore Sun, 18 May 1861; National Republican (Washington, DC), 18 May 1861, 3:2. Friday, May 16, 1862.Washington, DC. President transmits to Senate treaty with Kansas tribe of Indians. Abraham Lincoln to the Senate,  May 1862, CW, 5:218-19. Orders that his thanks for capture of Norfolk be sent to Gen. Wool by War Dept. N.Y. Tribune, 17 May 1862. Confers with Gen. Charles S. Hamilton recently relieved of command by Gen. McClellan, for reason that he is "not fit to command a Division." N.Y. Tribune, 17 May 1862; Abraham Lincoln to George B. McClellan, 21 May 1862, CW, 5:227. Saturday, May 16, 1863.Washington, DC. President, accompanied by Secs. Seward and Stanton , leaves Navy Yard about 11 A.M. for trip down Potomac to inspect troop transports. Extracts from Dahlgren Diary, John G. Nicolay Papers, Library of Congress, Washington, DC. Directs secretary of war to instruct Gen. Burnside to parole Maj. Clarence Prentice (CSA), rebel prisoner in Camp Chase, Ohio, "to remain outside the limits of both the loyal and disloyal States, or so-called 'Confederate States' of the United States of America, during the present rebellion." Abraham Lincoln to Edwin M. Stanton, 16 May 1863, CW, 6:219-20. Monday, May 16, 1864.Washington, DC. President sends to Mrs. Augustus C. French, wife of former governor of Illinois, autograph to be used at Mississippi Valley Sanitary Fair. Lincoln to French, 16 May 1864, in possession of Cyrus French Wicker, Miami, Fla. Holds financial conference relative to converting existing 5 percent loan to 6 percent. Abraham Lincoln to Salmon P. Chase, 18 May 1864, CW, 7:347.